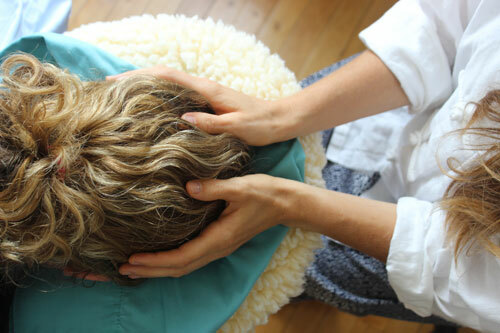 Craniosacral is light-touch manual therapy that gently releases deep tension in the body to relieve pain and dysfunction and improve physical and emotional health. It works to restore the body's innate healing mechanism. Our amazing Craniosacral therapists use this light touch work, energy work, guided meditation, stone therapy, lymph drainage, fascial work, ancestral work, and anything else the body may need to restore it to optimal health and balance. ﻿﻿Read about our CranioSacral practitioners, Mary Frank and Carrie. CranioSacral Therapy (CST) is the art of deeply listening to the health and resources within the body. At a deep level, all the various tissues of the body “breathe” with the motion of life. The restoration and vitality of this breath offers a pathway to sustainable health. CranioSacral Therapy is a light-touch manual therapy performed on a person fully-clothed. It is a technique for perceiving and enhancing natural fluid tides within the body. It encourages natural healing and corrects cerebral and spinal imbalances that may cause sensory, motor or intellectual impairment. When a body/mind/spirit is touched on such a deep level, very profound healing can occur. During the course of our lives, our bodies become conditioned to individual patterns of dealing with stress. If stress or trauma is overwhelming or repetitive, the trauma locks in the body forming a site of inertia. These sites upset the natural movement of our bodies, and our ability to have optimum health at a cellular level. Releasing tension that blocks the Craniosacral rhythm can deeply calm the nervous system and improve many stress-related conditions like insomnia, depression, PTSD, anxiety, headaches and other maladies. CST enhances the circulatory system to help reduce pain and improve immune system function to aid in fibromyalgia, arthritis, sciatica and other structural challenges. There is also an emotional component that CST addresses. Physical tension and disease in the body may be connected to strong feelings. A hunched posture, for example, can be the result of fear experienced in the past. With a supportive environment and the precision of CST, the tissue is able to relax, release, integrate, assimilate and heal at a deep level. It is suitable for all ages from newborns to the elderly. Because it works with a system that other techniques do not address, it can be an effective alternative or complement where other therapies have not provided relief.